Chinese Letters Appearing in tab on startup when Maxthon opens. Yes , very briefly on the New Tab, then it reverts to reading New Tab in English when English is the language of choice. Is that a problem? Been noticing it too in both instances cited. Thank you for reaching out to us. I have reproduced this issue and forwarded it to the test team. 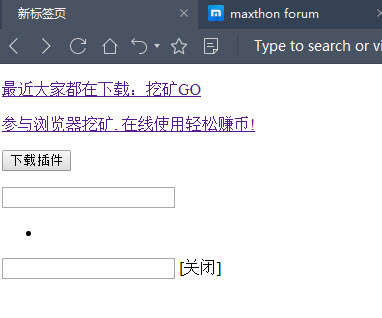 When starting Maxthon 5.2.3.5000, while loading the New Tab, the title briefly changes to some Chineese text and then reverts back to the New Tab (in selected language). 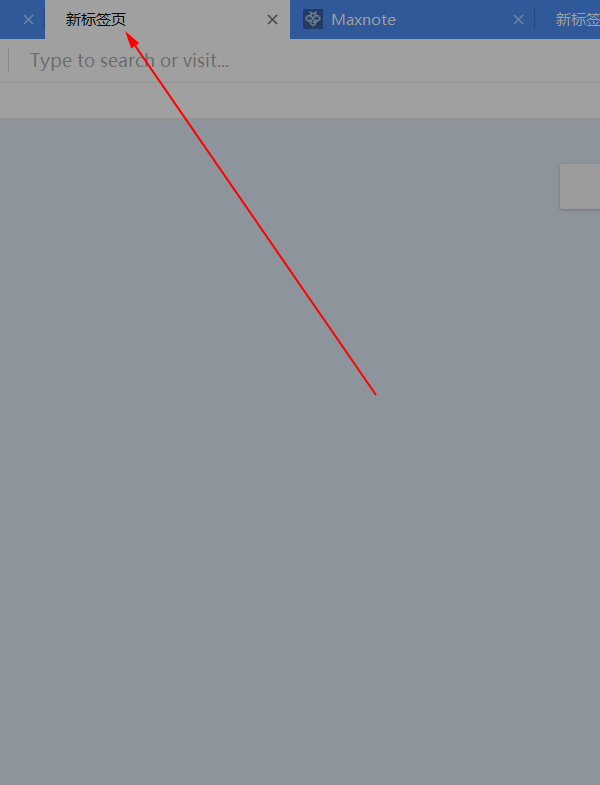 This does not seem to happen when opening a new tab from the browser, however it happens much more faster and there's no guarantee. For me it's almost the same, but even worse, it doesn't redirect me to a new tab at all, it just stays on the page. The page itself also shows chinese characters. Seems to me Maxthon is doing something fishy again, please fix. It is a Chinese based browser, so random Chinese characters that may not have been picked up during testing might show occasionally. As far as being fishy, i think that's a bit of a stretch. If you're at all concerned, just copy the text into any translator and see what fishy-ness they're trying to do. If any browser maker wanted to do anything nefarious there's a hundred ways they could do it without even alerting the user to it. It's possible they have Chinese as the default language (it's a chinese browser after all), then they check for the language in use, then it changes to that. Downside is that it may take a second so things like this show up. long time user but freshman to this community. uninstalled and cleaned everything still have issue with the new maxthon. As for the chinese charactors, notthing to worry about---it's about "new tab" and new mining feature they are trying to promote. Even though normally some random Chinese characters might show, it's still strange that this happens when openening a new tab, why would there be any need to load some page first and then redirect to the actual 'new tab page'? As for Maxthon being fishy, they have a track record of doing fishy stuff, so it's not really that big of a stretch. In the past they've had issues with handeling SSL/HTTPS connections, they've messed with the search provider, even when a custom one was chosen, they've messed with this mining 'feature' without informing their users, so it's not really all that strange to think they are trying something like that again. And as Tur says, Malwarebytes doesn't flag malware on that page for nothing, so there is in fact some fishy code on that page that Malwarebytes notices. But whatever the case may be, there's still an issue with the tab not going to the actual new tab 'page'. It just stays on the page with the Chinese text, so I can't use my bookmarks/favorites on the new tab. so random Chinese characters that may not have been picked up during testing might show occasionally. Given that it's just plain text it looks like the page hasn't fully loaded. Refresh, clear cache, restart, would be the first things to check with. They may have been tasked with other things to test. EG. a new feature, or a bug that's been fixed. They may not be testing with other languages so seeing Chinese text isn't a reason to flag anything. It's a placeholder for something that hasn't been translated yet. The issue may not have occurred on their test system. Lots of reasons why bugs are missed. I posted this just to inform the developers to fix this. I'm not bothered at all, however, if they are trying to acquire more users, it's better those characters don't show up. This is the place for your avatar, seems you don't have one, so probably it displays some message instead. version 5.2.3.6000 does not fix ----new tab still not showing any quick access and malwarebytes still flag it as riskware!!! Hopefully maxthon 6 can address all this issue. new tab still not showing any quick access and malwarebytes still flag it as riskware!!! New tab isn't showing because malwarebytes is blocking the page. Exclude it for that page and it will work. Malwarebytes need to update their lists to remove the warning. That will be up to them on how they determine a "risky" site, and Maxthon to speak to them as to why they are flagging it. This issue you are having is NOT a Maxthon issue, in that there is a problem with the QA page, the problem is that it's being blocked. why 5.2.3.5 and 5.2.3.6 have this issue not the old version? why these two version constantly want to to connect to the server in China? what is the purpose of this? why the previous version not detect such behavior? 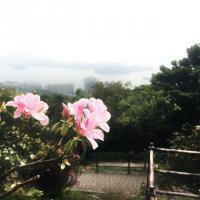 I understand what you said by excluded it . there are many work around, like adding the address to the host file, etc. This is not the solution/answer to the question. the developer should talk to the malwarebytes not the user manually exclude it because we have no idea why it connected to the server in china(same as the car dealer need to address the missing screw to the manufacturer). without knowing why, I can't excluded it, simple as that. I have read others post the staff/developer answer the chinese text issue but I don't see them to address the issue of the malwarebytes, and explain why it connect to the server? it make sense to you but not me and other people here. Again, I'm a long time user since myIE2. Mathon is a great browser and I'm still using it despite the issue I listed. I'm trying to provide the constructive feedback and hopefully the developer will come to addres the issue, lesson learned and improve the quality of the broswer. P/S 7twenty, I greatly appreciate it and thank you for your help in this community as I see you did provided a lot of usefull tips and helping other solving their issue. My appologize if I offence you, please don't be. T work around or the solution just not convicing me enough here. but I don't see them to address the issue of the malwarebytes, and explain why it connect to the server? it make sense to you but not me and other people here. Since MX5 the QA page hasn't been a local page like in MX4, instead it's now stored online. I believe the intent is to allow the data to be used over multiple installs in various places. You can check this by disabling your internet connection and refreshing the QA page. You'll notice you will get a connection error. While there has been much debate about this, esp. if the maxthon servers can't be accessed, to date it seems the company doesn't want change this...except that they don't need to. Because of this discussion, I did some playing around and it seems the page works exactly like a normal webpage. That is, if it can't access the online version then the cached version will be displayed. Only problem is that on the first refresh you'll get the "Chinese writing page", but refreshing the page (F5) will show the normal QA, which as far as i can tell is the cached version. I tested this by blocking the IP address via HOSTS, which should be the equivalent of Malwarebytes blocking the page. Also tested using a Passport and guest account and both worked the same way. While this may seem "fishy" to some, esp. when flagged by a program such as Malwarebytes, i don't believe there is any malice intended - just to make it easier to access your QA sites anywhere. So it seems we're back to the start where it's not a Maxthon issue - and that Maxthon does have a local QA page (despite all the complaints till now). Just that it takes an extra step to display it (F5). What would be nice is that they use this unintended "chinese error page" to display a message like "Your online QA data can't be accessed at this time. Refresh the page (F5) to show the cached version".... or something to that effect. As far as the Chinese text, it seems to be remnants of the banner for the cryptocurrency extension. It seems the CSS isn't loaded, but bits of the HTML are still left behind so get displayed. At the end of the day i don't see this as a major issue, but i do think it should be fixed given how it can be, and has been interpreted as a potential concern. You are talking about MX4, we however are talking about older versions of MX5. I've been using MX5 from the start and never before did malwarebytes flag the QA page. So in my opinion there are two options: 1. Malwarebytes got an update and now has extra checks, which is why the QA page gets flagged. Or 2. 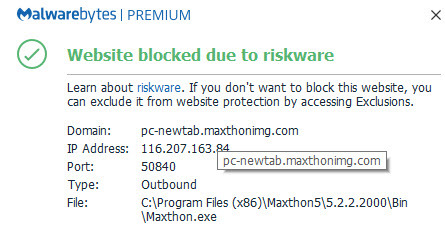 Maxthon QA page got changed with code that Malwarebytes sees as malicious. Seeings as on 2 computers I've tested this on, the problem appears after updating Maxthon, I'm putting my money on nr 2. No matter the case though, it's not a Malwarebytes issue, it's an issue with the QA page, even if Malwarebytes got better detection, there's still some strange fishy code on the QA page. A normal HTML/CSS page won't ever get flagged by Malwarebytes, only sites with some code that can be executed on the users computer will get flagged. Taking into account that Maxthon has been exprimenting with Cryptomining and Malwarebytes actively blocking sites that mine without consent, I'm betting there's some mining code running on the QA page. If that is indeed the case, it should be removed from the QA page, not ignored/whitelisted in Malwarebytes. There are a lot of dynamics in the QA page, also the option to have a animated background. I am quite sure there is JS there. Also, for such a page, it is quite normal and maybe essential to have JS running. However, as far as the QA page and the need to sync between devices, I should say this has little to do with the decision the page is hosted "in the cloud" or put another way - on Maxthon's servers. The truth is this page has to be offline and always on the user's device, so it is loaded fast and even without connectivity. Especially when we use Maxnote and Passkeeper (which may be used even if you want to access the stored info for other needs) - then many times you won't even need connectivity. But why wait loading some page from a distant server (we are not all in China, right?!). The best way IMHO to sync the content is to have a small DB with the names, settings etc. of the QA page and sync that DB when needed (that is, when a change occurs). Also, those hundreds of blocks of URLs down the page are quite useless, nobody scrolls there. You either use the first screen or bookmarks (yes, we still use those, although Maxthon keeps making it harder). Adding to that, my QA is not synced to my Android phone and it never got synced to my iPhone. So, what is the use for this sync talk and this online storage? What happened with the cloud browser anyway and the ability to "continue on another device"? Microsoft implemented it in their Android shell and in Windows 10, but Maxthon some way forgot about it. 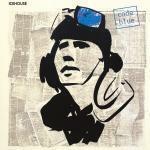 Where is my cloud push? It was a perfect feature, now not available in MX5. I also do not see any need for the browser to have any connection or synchronization that is not desired, and more so when there are people who do not want to have an account with maxthon. The browser is not only used to "read" online pages, it is also a tool that is used a lot offline. You do not need a QA (or anything else) that has a connection to any server. It would be very good to put, "a view " of how load each thing (notes, markers) understand what I say? Because I am lost on the browser, I dont know if are charging or not. Every time ( click on new page a Chinese type header/title appears. I'm not allowed to attach the screen shot.